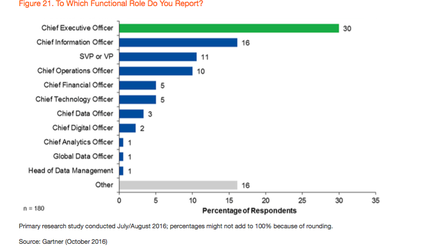 Gartner survey finds a third of CDOs reporting to the chief executive. By 2020, 15 per cent of successful CDOs will move into CEO, COO, CMO or other C-level positions. Gartner's second annual chief data officer (CDO) survey finds early adopters of the CDO role and the office of the CDO (OCDO) are pioneering a new organisational function, to go alongside IT, business operations, HR and finance. 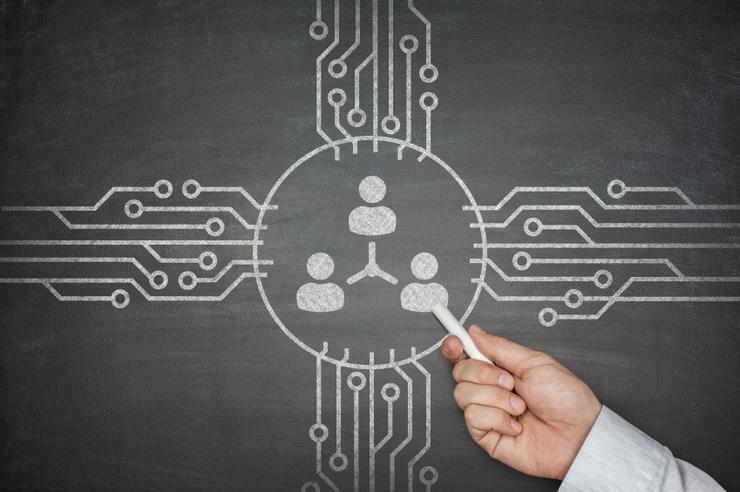 Organisations that have made the strategic decision to introduce the CDO role are looking to get as much new value as possible from this position, according to a new report by Gartner analysts Jamie Popkin, Valerie A. Logan, Debra Logan and Mario Faria. Thirty per cent of the surveyed CDOs said they report directly to the CEO. The report notes CDOs are adding to the competitiveness of their companies by contributing to strategic planning and decision making, and by leading digital business initiatives. Thus, Gartner predicts that, by 2020, 15 per cent of successful CDOs will move into CEO, COO, CMO or other C-level positions. Gartner likewise foresees in four years, 25 per cent of chief data officers will have moved employers because of the demand for successful CDOs. For those aspiring to become a CDO, Gartner says the role will require a broad set of change management skills that include communication, collaboration and consensus building. "The office of the CDO is being established as an operational department with the appropriate staffing, budget and responsibilities," says Debra Logan, vice president, Gartner. "Fifty-four per cent of the organisations we surveyed said that their OCDO was fully or partially implemented, with a further 20 per cent already exploring, planning to explore or planning to implement an OCDO within the next year. Only 19 per cent said they are unlikely to implement an office of the CDO." Gartner says the survey, conducted in July and August this year, covered 180 CDOs, CAOs and other high-level data and analytics leaders from across the world. According to the survey, the main business objectives of the OCDO are to increase customer intimacy (62 per cent), competitive advantage (60 per cent) and efficiency (54 per cent). Respondents said that the main organisation-wide responsibilities are oversight of analytics initiatives (69 per cent) and data governance (68 per cent). Next come responsibilities for defining the analytics strategy for the organisation and ensuring information reliability and value (64 per cent each). As the use of data and analytics continues to rise, data and analytics-related crises will continue to plague businesses that fail to implement the CDO role and an OCDO. "While only 27 per cent of those surveyed identified a specific data or analytics-related crisis or problem as their reason for creating the CDO role, some of the other identified objectives point to this," says Jamie Popkin, a Gartner vice president. "Twenty-four per cent of the respondents said that the board of directors wanted the role. Whatever prompted a high degree of board-level involvement in the creation of the new operational function must have had a major operational impact, or been thought likely to have such an impact in future. "The board's involvement, together with the responses pointing to a specific crisis or problem, and the 41 per cent of respondents who said that the CEO or CFO wanted the role, makes it safe to assume that this was a major strategic decision that affected business operating models." The OCDO covers a wide range of roles emphasising data and information management, data quality, business analytics and information architecture. "Most CDOs said that their role will focus on two key responsibilities," says Mario Faria, a managing vice president at Gartner. "Sixty-seven per cent of the respondents said they are acting as a champion or change agent in leading the organisational changes required to create and sustain enterprise data and analytics capabilities. "Sixty-one per cent are leading the effort to ensure that data and analytics are integrated into the business strategy and roadmap." Seventy percent of respondents, meanwhile, have some responsibility (owning or contributing to) within the office of the CDO for partnering with the chief risk officer (or equivalent) to ensure the ethical use of data and analytics. 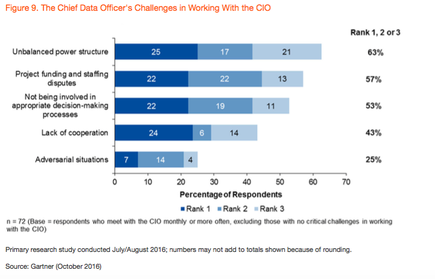 Given that the "I" in CIO stands for information, the survey explored the relationship that the new CDO and the office of the CDO have with the CIO. Forty-four percent of respondents said they work regularly with the CIO and reported no challenges. Of the remaining 56 per cent who mentioned issues, the top issues are unbalanced power structure, project funding and staffing and not being involved in appropriate decision-making process. Early adopters of the CDO role have developed positive working relationships between IT and the office of the CDO, but these issues will be sources of contention between IT and the office of the CDO as the role becomes more broadly established, says Gartner. Gartner notes the rapid growth of the CDO role may indicate the early adopter stage of creating an office of the CDO is over and it is becoming mainstream, says Gartner. Thus, it recommends organisations to build an appropriate enterprise-wide focus around creating this new business function to speed up value realisation. "Develop your organisation's skill at creating new data and analytics capabilities, in order to capitalise on digital business opportunities."